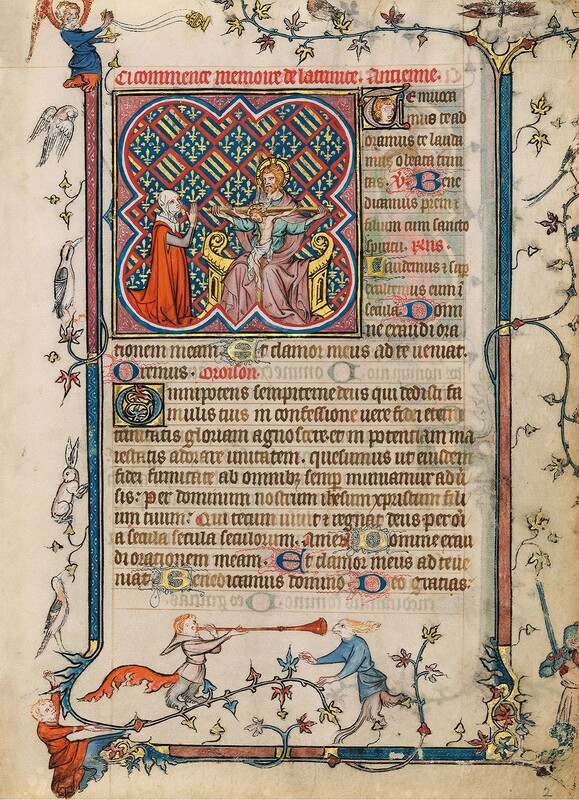 The magnificently illuminated Savoy Hours or rather, the only known remaining fragment of it after almost 600 years, delights the viewer with its marvellous colours, its sparkling gold, and its elegant proportions. Fifty miniatures feature delicate figures set against varied backgrounds decorated with gold grids, lines, sprays, and diapered or checkered patterns. 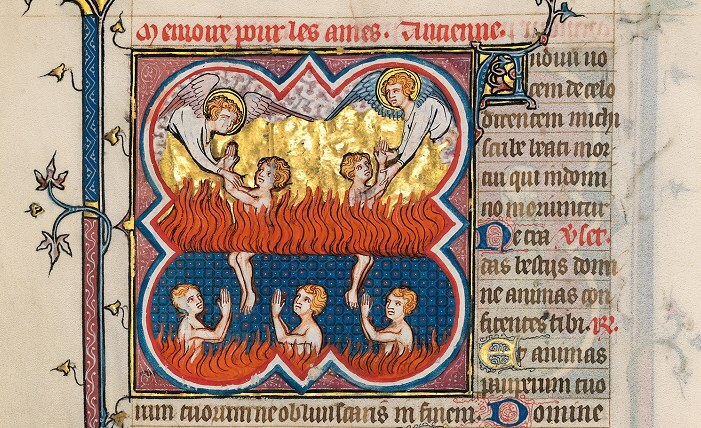 The manuscript was executed in Paris in the workshop of the renowned book illuminator Jean Pucelle and was later completed in a similar style by the Master of the Bible of Jean de Sy. This is a perfect example of sophisticated book art which never fails to fascinate and attract the interest of collectors! As a precious bibliophilic book the Savoy Hours has a heavily gold-tooled binding: it is the most noble fragment of a lost masterpiece (Roger S. Wieck, The Morgan Library & Museum, New York). In 1904 a fire in Turin destroyed the Savoy Hours. During the intervening centuries, the manuscript had been tampered with: various leaves had been removed. The remaining manuscript was severely trimmed, ruining its noble proportions. Had this magnificent book of hours been preserved intact, it would rank among the most spectacular manuscripts created in the Middle Ages. Its lavish illumination had inspired the Duke of Berry and stimulated his passion for precious books. What a stroke of fortune it was that in 1910 a part of this lost masterpiece was rediscovered in Portsmouth Cathedral! The remaining leaves of this fragment still attest to the remarkable beauty of the Savoy Hours. The Savoy Hours had been commissioned in the 1330s by Blanche of Burgundy from the workshop of Jean Pucelle in Paris. 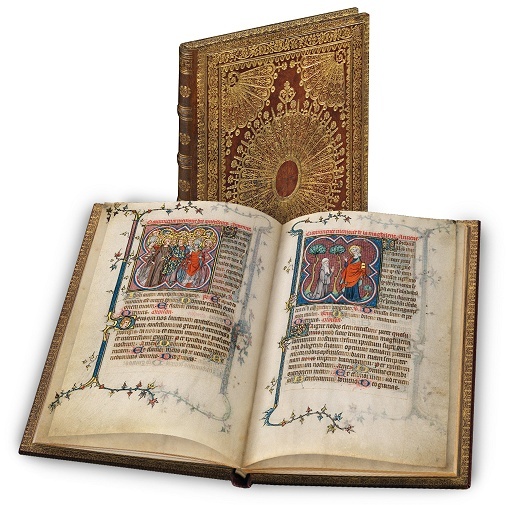 For the granddaughter of King Louis IX (Saint Louis) and the widow of the Count of Savoy only the best seemed good enough: a book of hours whose luxurious illumination would set new standards. A number of years after Blanche’s death the sophisticated manuscript made its way into the hands of King Charles V of France, starting a rivalry with his three bibliophile brothers, who competed as manuscript patrons. In particular Jean, Duke of Berry, became obsessed with books of hours: indulging in a veritable manuscript mania, he commissioned, inter alia, the Très Riches Heures. In 1409 King Charles VI of France gave the Savoy Hours to his uncle Jean, Duke of Berry. In 1720 it re-emerged as one of the volumes which Duke Victor-Amadeus II of Savoy donated to the university library in Turin. 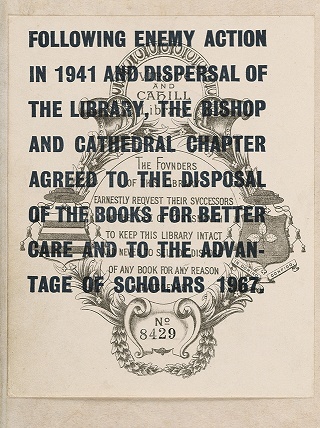 In January 1904 the manuscript was destroyed. In 1910 a monk discovered 26 leaves of the Savoy Hours in the library of Portsmouth Cathedral. They had been gifted to the diocese by John Virtue, first bishop of Portsmouth. Transferred to a safe place during the Second World War, the value of the fragment was recognized in the mid-1960s. When the cathedral was robbed, the fragment was amazingly thrown into some bushes. “For better care”, the cimelia was sold and in 1969 acquired by Yale University. 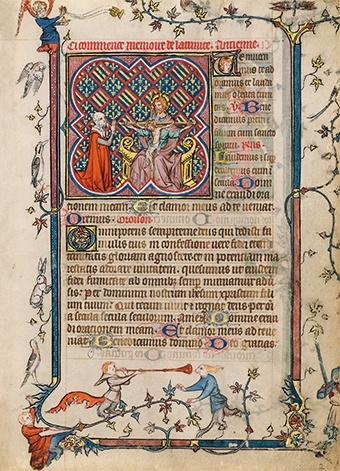 Exerting a major stylistic influence on the history of book illustration, the Savoy Hours has been highly seminal for our perception of French late Gothic book illumination. The Hours served as a model for the development of the book of hours, the most widespread genre of illustrated text from the late Middle Ages. The manuscript influenced the taste of the two most important patrons of art in the late fourteenth century. They were mainly impressed by its great length, its encyclopaedic cycles of miniatures, and its almost excessive use of portraiture. In the miniatures of the Suffrages (short intercessory prayers), the only part of book that has survived, there are no less than 25 portraits of Blanche of Burgundy, who commissioned the book. She is shown kneeling in front of the saints. The miniature on fol. 2r shows Blanche with a white head-dress and a scarlet cloak, kneeling in prayer before the Trinity. The graceful figures, their delicate faces and finely drawn contours, and their elegant gestures and harmonious proportions are especially charming. The scene is set against a background in imitation relief which consists of diagonal heraldic squares displaying the royal fleurs-de-lys on a blue ground alternating with the arms of Burgundy, bendy of six or and azure, a bordure gules. The miniature is enclosed in a quatrefoil made of a blue, white and red band, from which the four tips of a square are projecting. The decoration in the margins features a typical Gothic bar border with ivy leaves attached, as well as grotesques, birds, and a small rabbit. The Savoy Hours is a fascinating remainder of an exceptionally beautiful manuscript which was larger in format and more luxurious than any preceding book of hours made in the late 14th century. 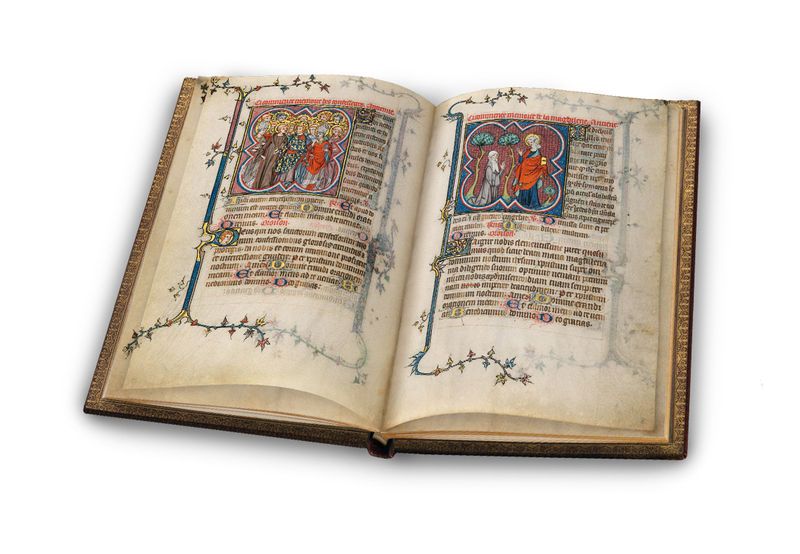 Today, the viewer is as captivated by the pages glittering with gold as was the Duke of Berry in the late 14th century. 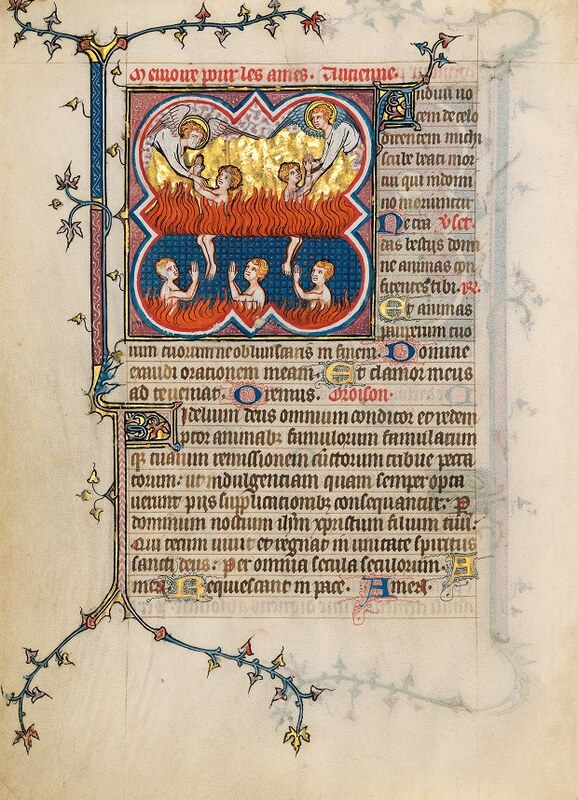 The sequence from the surviving part of the Savoy Hours reproduced here comprises fols. 7r-9v, exemplifying the style of French late Gothic. 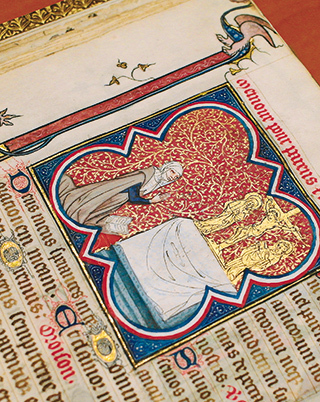 In the very delicate and high quality miniatures Blanche of Burgundy, who commissioned the manuscript, is shown praying to various saints: to Benedict (fol. 7r), to Mary Magdalene (fol. 8r) and to Catherine (fol. 8v). On fol. 9r, however, Saint Margaret is represented emerging from the dragon’s belly. The miniature on fol. 7v shows all the confessors, and the one on fol. 9v depicts all the virgins. The two-line initials on gold grounds are embellished with faces, floral ornaments and coats of arms. 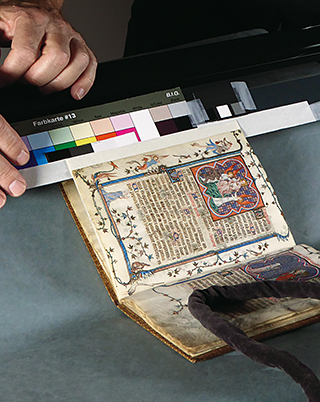 The best specialists in their respective fields work together while producing the facsimile of the Savoy Hours. First, photographs of the original manuscript are taken on location. The lithographer then prepares the digital data and makes the print runs for the colour printing, the reproduction of the gold and silver areas, and the patination. The gold areas which reflect the light differently on every page are especially challenging. Every small glittering detail has to be treated with the utmost care. Separate procedures are applied to reproduce the various gold areas, and their splendour is superbly captured on the special paper used. In the 18th century the 26 remaining folios of the Savoy Hours received a treasure binding made of leather heavily gold-tooled with a filigree lace pattern (“à la dentelle”). 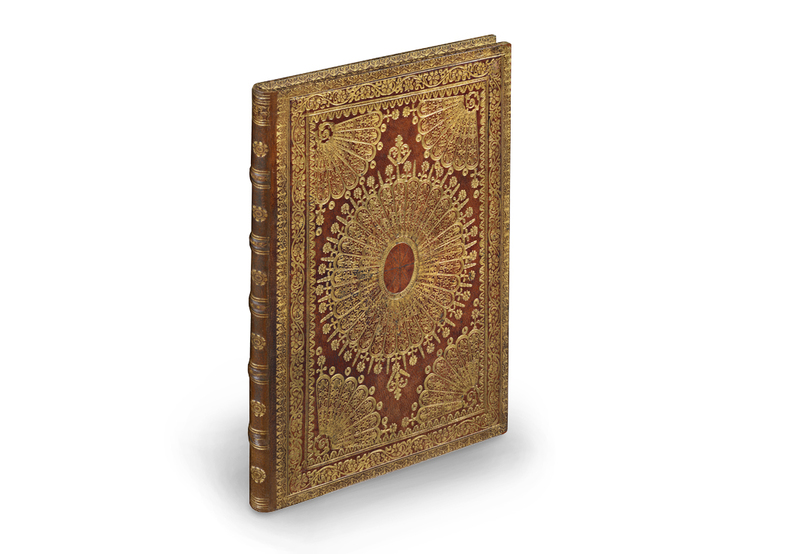 To reproduce such a masterpiece for the facsimile edition true to the original, the bookbinder needs to apply the entire range of his skills as well as his considerable experience in a traditional craft. In a time-consuming process, the ornamental panels for stamping the leather binding are cut by hand. In addition, the facsimile volume is enclosed further in a silk-lined linen cassette, which in turn is protected by a slipcase made of fine red morocco. Like the original, the facsimile of the Savoy Hours is a bibliophilic object, its protective coverings thus literally celebrating a step-by-step approach to its precious content. The Savoy Hours is an exceptionally beautiful illustrated and fascinating manuscript which was highly seminal for our perception of French late Gothic book illumination. In conjunction with its edition of the surviving fragment, Quaternio Editions Lucerne has produced a high-quality facsimile folder. It contains an original facsimile leaf (fol. 14) showing Saint Martin on its recto side. On the verso we see Blanche of Burgundy, who commissioned the manuscript, kneeling in prayer before Saint Remigius. Detailed captions describe the illuminations. 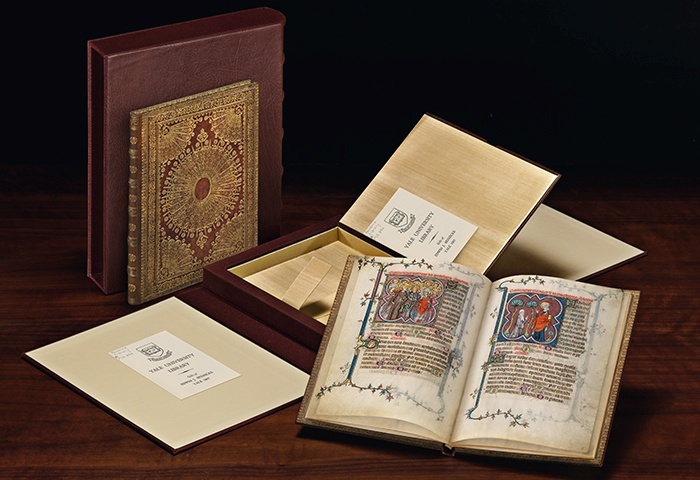 In a richly illustrated brochure of 12 pages, learn more about the exciting and eventful history of this manuscript, its masterly art and the production of the facsimile true to the original. 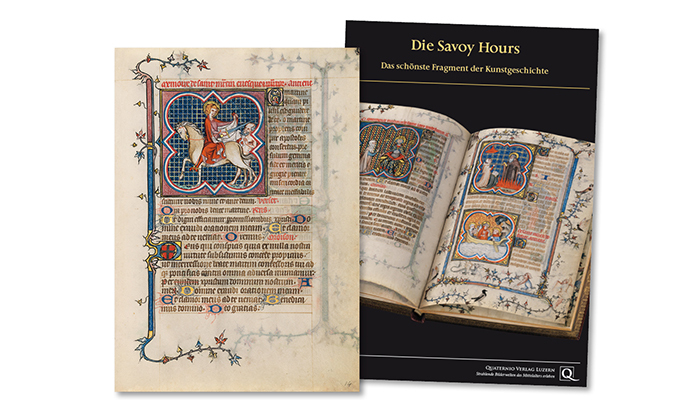 Click here to go to the online shop (only available in German) where you can order the facsimile folder for the Savoy Hours edition. Or send us an email to info@quaternio.ch. We would be glad to provide you with additional information regarding the fine art facsimile edition of the Savoy Hours. Click here to order the brochure.